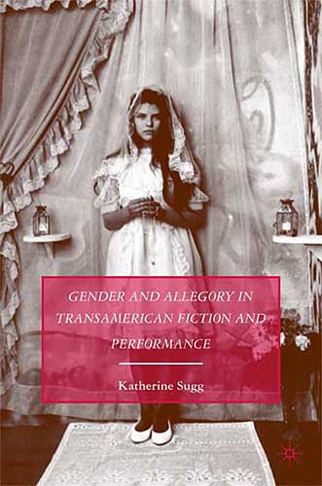 By rethinking contemporary debates regarding the politics of aesthetic forms, Gender and Allegory in Transamerican Fiction and Performance explores how allegory can be used to resolve the “problem” of identity in both political theory and literary studies. Examining fiction and performance from Zoé Valdés and Cherríe Moraga to Def Poetry Jam and Carmelita Tropicana, Sugg suggests that the representational oscillations of allegory can reflect and illuminate the fraught dynamics of identity discourses and categories in the Americas. Using a wide array of theoretical and aesthetic sources from the United States, Latin America, and the Caribbean, this book argues for the crucial and potentially transformative role of feminist cultural production in transamerican public cultures. Sugg, Katherine. Gender and Allegory in Transamerican Fiction and Performance. Palgrave, 2008.